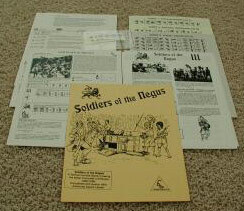 Soldiers of the Negus, published in 1994 by ELR (essentially Rick Thomas, Jim Berhalter, and Dirk Heinz, was one of the earliest ASL third party scenario packs. It featured scenarios of a most exotic sort–from the Italo-Ethiopian War of 1935-1936. It includes a sheet of unmounted counters featuring Ethiopian squads and Italian colonial troops. The greatest advantage this scenario pack has going for it is its colorfulness. There are rules for the poorly armed Ethiopian Army (it even has some 2-3-7 squads), which can try to flip over the tiny Italian tankettes, as well as rules for terrain features such as Candelabra trees and for Eritrean (Italian colonial) troops. The scenarios are an interesting mix, with most of them somewhat on the large size. Six out of the eight scenarios use desert terrain. The original Soldiers of the Negus, which was printed only in very small quantities, is very hard to find. However, it was reprinted several years later by Critical Hit with a sheet of die-cut counters. Although the Critical Hit version ostensibly contains some errors, the mounted counters make it more desirable than the original version.